About Junghye Yoon : Honeydew Rabbit has children's best interests at heart and values their fun and safe experience. The smiles of little kings and queens of the world never fail to warm the atmosphere. Honeydew Rabbit keeps children's smiles in mind. We always strive to create something delightful, not dull, that would make a child smile. 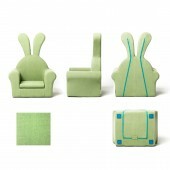 Honeydew Rabbit wants to give only the best to children. Non-toxic, environmentally-friendly materials and thoughtful, safe designs protect children's health and safety. All production processes take place in Korea, which ensures easy quality control. A smile from a kid makes the parents quickly forget the hardship of childcare. We feel genuine excitement thinking about a child happily playing with our products. We are committed to creating something that will make parents at ease and children happy. Honeydew Rabbit means 'a rabbit wearing the rind of an white honeydew melon on its head'. The color white signifies children's pure hearts, while the rabbit wearing the melon on its head symbolizes children's simple-mindedness. What gives you a sheer happiness like a baby? I think the answer is design and creativity. I believe that the design is something that keeps a children’s imagination, and such design gives the connection with the world. Press Members: Request an exclusive interview with Junghye Yoon.